Partly cloudy skies early will give way to cloudy skies late. Low near 45F. Winds E at 5 to 10 mph. Bloomington sanitation specialist Delvar Dopson is the hero of Brooklyn Andracke, 3, as he picks up trash at her home with his garbage truck. Brooklyn Andracke, 3, plays with her toy garbage truck in her south Bloomington home as she waits for the arrival of her favorite sanitation worker. Brooklyn Andracke, 3, waits for a city of Bloomington garbage truck to pick up refuse at her home. 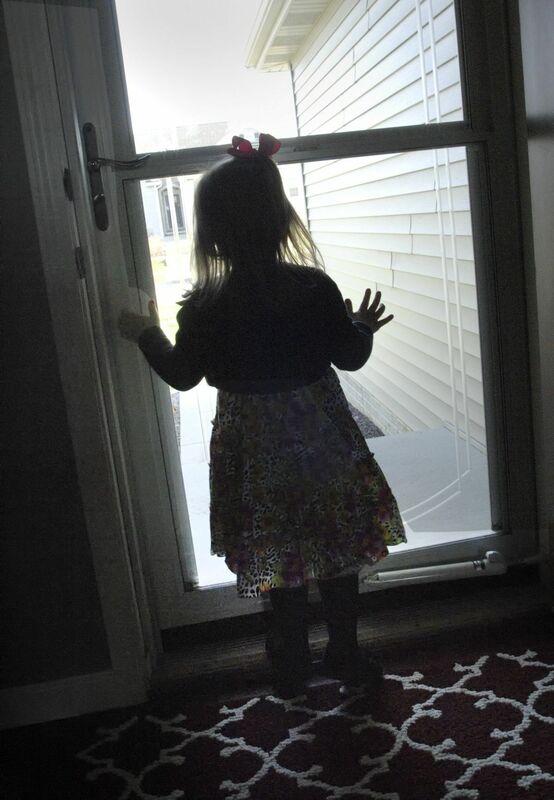 Brooklyn Andracke, 3, waits for the arrival of her favorite garbage truck driver Thursday. Brooklyn Andracke, 3, watches as Bloomington sanitation specialist Delvar Dopson jumps from the cab of his garbage truck during a visit with Brooklyn and her mother, Thursday. Brooklyn Andracke, 3, greets her hero, Bloomington sanitation specialist Delvar Dopson, as he makes a pickup at the Andracke household with his garbage truck Thursday. Dopson brought Brooklyn a present to mark her third birthday. Brooklyn Andracke, 3, meets Bloomington sanitation specialist Delvar Dopson at her home with her mother, Traci, Thursday. Brooklyn Andracke, 3, gives Bloomington sanitation specialist Delvar Dopson a thank-you sign and a hug after Dopson stopped by the Andracke household to make a pickup Thursday. Brooklyn has been waving to Dopson for a year and has developed a fascination with his garbage truck. Brooklyn Andracke tells Bloomington sanitation specialist Delvar Dopson that she just turned 3 years old, as he made a stop at the family's home Thursday. Her mother, Traci, is at center. Brooklyn Andracke, 3, receives a happy birthday wish from Bloomington sanitation specialist Delvar Dopson, who met with Brooklyn and her mom, Traci, Thursday. Traci Andracke gives Bloomington sanitation specialist Delvar Dopson a hug after Dopson stopped by the Andracke household Thursday to make a pickup with his garbage truck and say hello to her daughter, Brooklyn. Brooklyn Andracke, 3, gives Bloomington sanitation specialist Delvar Dopson a thank-you sign and a hug after Dopson stopped by the Andracke household to make a pickup with his garbage truck Thursday. Brooklyn Andracke, 3, gives Bloomington sanitation specialist Delvar Dopson a wave goodbye after Dopson stopped by the Andracke household to make a pickup with his garbage truck, Thursday. Brooklyn's brother, Ty, 13 months, and mother, Traci, watch.